This thing of writing to Ellen in St. Paul and Reid in London is taking some getting used to. It’s strange to not affix a stamp to each of two envelopes. The idea of emailing attachments to the Reidster runs counter to everything I’ve practiced in the past 11 years of knocking out the Monday letters. The U.S. Postal Service is probably planning for the budget shortfall. A rudimentary computation a couple of years ago uncovered that I’d already popped for several hundred dollars in postage alone, and in today’s dollars the out-of-pocket expense has zoomed past $500. That’s a lot of letters from a dad to his children. 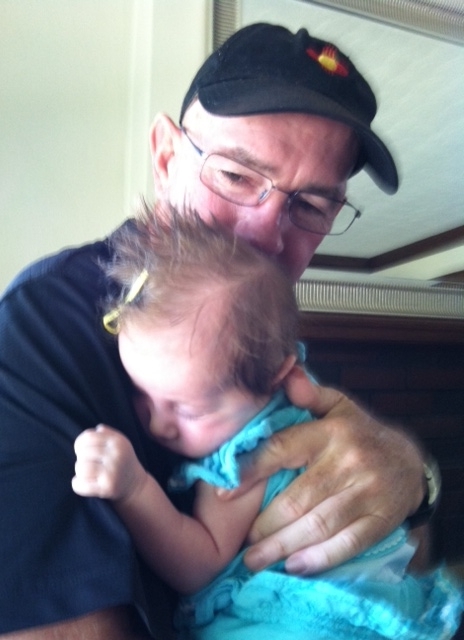 Emma holds on for dear life to her gramps as she catches another nap. She’s nearly doubled in weight, and quadrupled in cuteness. The build up these last few weeks before the pilgrimage to see Emma in St. Paul has come and gone. Felicia and I returned last night none the worst for grandparental wear. The little cutie pie is doing well (despite her bumbling gramp’s awkward efforts to hold her). Unlike riding a bike, at least this guy needed to learn Baby Holding 101 all over again. I did, however, escape changing any diapers, as I was always a moment too late. Darn. Felicia stepped up big-time in that role. I pledge to move quicker next time. This time next week I’ll be huffing and puffing at 10,000 feet, trying to keep up with my boys Tom and Richard. Excitement isn’t the right word for this trek as I have transcended excitement. But like most things long anticipated, what has been too long in the planning will too soon be over. Already, son-in-law Tim has decreed another – and newer – route in 2013 through this part of the Wind River range in his pursuit of trophy size Golden Trout. If he will have me among his troupe of youthful hikers, I am game, game, game for it. No news from Reid this week. Such is the way of his world. I’d love to hear from the lad before shoving off for Wyoming and the Bridger. If I don’t hear from him, at least he will hear from me. Here is last week’s letter. Ellen/Reid: About the only thing that benefitted from the near-record heat here was our tomatoes which have come on like gangbusters. Grass, trees and flowers took a pounding with or without water. Nothing can flourish in nature’s oven. And if it weren’t for the heat, it would be the humidity. Reid, you were just the opposite over in London, what with rain, rain, and still more rain. I suppose that’s good in some respects given Briton’s love for gardening. It does get old sweating all the time. You can’t even walk to the postbox without working up a good drenching. Its good your mom got you guys a spare AC unit, Ellen. That’ll help the three of you immensely. I’ve been doing my daily walk in the midst of all of it, and am thankful for the workout although the pounds aren’t shedding quite as quickly as they used to do in yesteryear. A cold Nalgene has made the treks around the block a little bit more palatable. For some reason I was reminded this weekend of what it felt like to run long distance in the heat, and am glad those days are long, long ago. My old gang of Ironman, Joe, Rand, Beamer, Bob O. and Jetz used to run 20 miles on Saturday mornings at 7 o’clock, and by the time mid morning rolled around as we finished, you could’ve poked us with a fork because we were done. Those were the days, and good riddance. I watch some of the runners around here hobble their way on the pavement, and I just want to pull them aside and tell them to find something else to stay fit. It is tempting to tell them to bicycle except bikers are getting run over by cars all the time. You’re damned if you do, damned if you don’t. We’re excited to head up to Minneapolis this weekend. It will be great to see how little Emma has grown – from the photos, she’s becoming a chunk-ette. But I say that with all good intentions. She is just such a little sweet pea. Felicia keeps telling me we have to be considerate of your family time so we’ll tastefully bow out and retreat back to the B&B at the appropriate time. ‘Gramps’ is available to do any chores around the house that you and Tim see fit. Betsy has strongly suggested that we take Felicia over to the Big Mall so she can see how Midwesterners spend their idle time, and it would be a good way to get your b-day gift, Ellen. 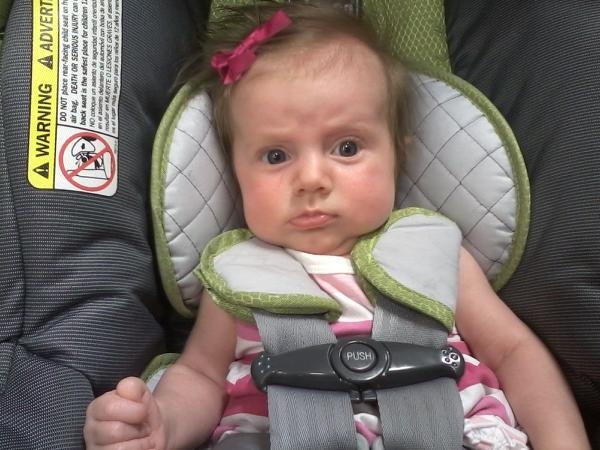 Gramps calls first dibs on pushing Emma in her Rolls Royce of strollers. Everything is all packed for Wyoming. The excitement is really beginning to build. I’ll be toting much less in the Bridger Wilderness than was done in previous years. I’m gonna guess about 35 lbs. At least two pounds of that is gorp. Food is pretty much pasta and dried sauces, cheese grits and oatmeal for breakfasts, power bars for lunch (plus tin foil for any hapless trout that mistake our store-bought flies for real food). Looks like no fires – too dry out there – so we’ll lug two big bottles of white gas. The only cause for concern is my shoulders. For some reason, both have gone to pot at once over the past few months, and there will be hell to pay to put my pack on. Once it’s on my shoulders, no problem-o but it’s the getting it on my shoulders that will hurt. I literally cannot touch my back or reach up to my shoulders. Not sure why they would both go kaplooey at the same time. This is a reminder to me to call the doc to get his two cents on things. All in all, it’s hell getting old. Nothing much else to report. Same old, same old. Reid, it was great to get your call. You sound good, and I’m glad the Brits like your work. They are also models of civility and you should fit right in culturally. Let me know of your plans for continental travels. Might as well make travel-hay while the sun shines, as they say. Adieu. It’s almost time. In fact, it’s almost time twice. To answer your question, yes, everything fit into the pack (okay, maybe with some pushing and shoving). I’m ready to get this show on the road and hit the dusty trail. minimal clothing, food, fuel and MSR stove and cookpots, collapsible plate and coffee cup, mosquito net, maps, boots, Tevas, and a few other sundry, lightweight items. We shove off for Jackson, WY on Friday, July 20. Almost time #2: Felicia and I head northwest to Minnesota to check in on Emma’s progress at 2+ months and see her folks. She’s rapidly asserting her personality and no doubt she’ll find her grandpa all too pliable in her tiny hands. This grandpa thing is still all too new and I’m not sure how to grandparent from afar. Perhaps this week’s junket will help me figure it out. From the look of Emma, she still has only two rules: #1) “What I say goes, and #2) See rule #1.” What’s also clear is she is firmly in the driver’s seat. Perhaps this junket will help me figure that out. Here is last week’s letter. Reid is still in the U.K., so his copy went electronic late in the week. Ellen/Reid: We’ve been hammered by 100F+ heat the past few days. Reminds you of what summer is really like in the Carolinas which is code for ‘not very enjoyable’. The humidity is off the charts, too. It’s just less than hospitable for humans. My golf group slogged through a round on Saturday with people dropping like flies all over the place. We had poor one guy taken off by ambulance for heat stroke. The cart girl came up to us and asked if we knew this guy named Bill, because he needed help and was passed out on the next tee box. He had crashed his cart and stumbled to the grass. By the time we got there, the course superintendent had called 911 and help was on the way. Not a very pretty sight. It’s all about continued hydration. I consumed nothing but water and got through in good shape. Felicia’s daughter Suefan got in Saturday. She’s a good kid and is about your age, Ellen. She lives in Baltimore but she and her boyfriend, Ben, are moving back to Charlotte, hence her trip to look at something to rent. We went to a sushi place Saturday night where, for the first time ever, I knowingly ate some tofu. It wasn’t as bad as I assumed it to be. It’s like a bean curd thing. If you doctor it up (ours was fried) it is palatable. The raw octopus was really good and so was the eel. I would never seek out eel at the market let alone fish for them, but in a sushi place after a couple of cold ones and enough wasabi, and it’s not half bad. Reid, I’ve been wondering how London is going. What a time to be there: Wimbledon, Olympics, etc. That is fortuitous in that regard. There’s no way to get over there in time to see you, what with vacation semi-maxxed out and ticket prices being what they are in an Olympic year. But there’s always Chicago when you return. I tried to get Google Plus up and working but it was nothing short of a disaster on my iPhone. I created the wrong email, couldn’t get the account deleted, etc. So it’s still not working like it should. And Ellen, someone told me you can’t do FaceTime from an iPhone to an iPad. You both have to have to have the same device. But to confirm that, I will go over to the Apple store tonight to hear that factoid straight from the horse’s mouth. My trip to California was okay. Incredible weather and the meetings were fine. It’s just the return trip that set me back. To save the bank a few hundred bucks, I took the red-eye back on Wednesday night/Thursday morning, and there is a reason those flights are mostly for younger people. I hardly slept for lack of a comfortable position. Left L.A. at midnight and got home about 10:30 a.m. Was just fried the rest of the day. Totally gassed, and that lingered into Friday. No way will that ever be done again. Traveling just isn’t as much fun as it used to be. Enjoyed real, honest-to-goodness BLTs the past couple of days. The little patio tomato plant on the front stoop has come through like a champ. Its producing tennis ball sized fruit, and they’ve been mighty tasty. There was an article in the paper about how taste has been bred out of store-bought plants (in the zeal to have eye-appealing red fruit with a long shelf life, most of the tasty sugars have been cut out by the plant chemists). The commercial varieties are red, sure enough, but with the flavor and texture of cardboard. It’ll be fun to see how Emma’s little garden is progressing, Ellen. Can’t wait to get up there to see the little wonder (and you and Tim, too). The Bridger group came over Friday night. We didn’t plan much, just hung around and ate burgers and gabbed. All my gear is laying out in the front room. Trying to figure out how to take the pack as carry-on luggage since I’ve got two stops with a short layover between each. Don’t want to risk the darn thing being lost. In three weeks we’re on the trail, whether we’re ready or not. Reid is in England for his short-term work stint. Some people have all the luck. Poor kid has a nice apartment smack in the middle of central London (hopefully with his own ‘loo’), Wimbledon is on not far from his temporary digs, England made it to the knock out round of the European soccer championship and, of course, the run-up for the Olympics is gaining steam. Tough gig for a single guy. I just wish he’d stay in touch with us on this side of the pond. 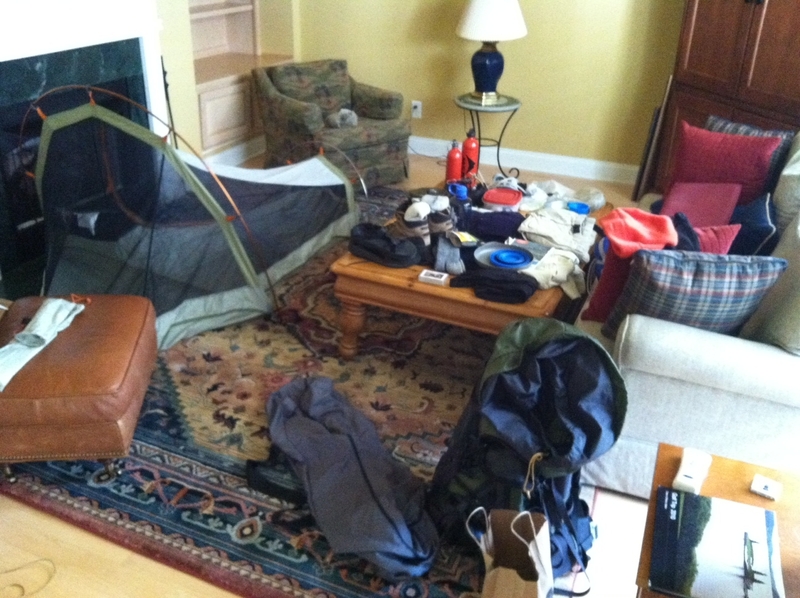 My living room is clogged with camping stuff in preparation for the trek in the Bridger Wilderness (note: we still have room for late comers, July 21-27) but there was no mention of it for the first time in a while in last week’s letter and there was scant mention of it in the letter that was mailed just this morning. The tinder-dry conditions are some cause for concern; unlike last year, there will be no fires on which to char-broil trout. Instead, we’ll make do with a white gas stove to heat water for pasta and beans and flash-fry brookies. Alas, my ancient but trusty40 year old MSR model A stove was lost during the move six years ago so a newer WhisperLite will have to suffice. I’ll no doubt get into the Bridger goings-on a little more in the note to the kids next week. Ellen/Reid: Monday has gotten off to a decent enough start but all that can crumble in the space of a few ‘do this…or ‘what do you think of this?…’ emails. But none of those have come in so all things as of this moment are BAU (business as usual in bank parlance). No sense mailing letters to your Chicago address until you return, Reid. You’ll have to open your email to read them. By the time this goes into the mail to Ellen, your plane will have already jetted east to London. You get all the fun trips. India. England. No doubt you will figure out a way to take the Chunnel beneath the channel to Paris or other mainland location. Heck, I would too, if I were you. Sad to say there is probably no chance for your old man to get over there for even a few days. The schedule just won’t allow it. I put on my blog this morning that if you were over there until, say, October or November then the odds of a visit would increase noticeably. But not right now. Too much going on. The one thing you need to do is send us photos and whatnot of where you are and what you’re doing. People ask and all I can say is “I dunno.” So keep your mom and I posted on your comings and goings. Ellen, your running cavalcade of photos of Emma has been just darling. It’s just like being there. Okay, not quite but it’s a great substitute for being hundreds of miles away. She has just changed so much. She’s putting on a nice amount of weight and her little smile is showing some personality. Believe me, it’s hard to remember them (i.e. you and your brother) at this age once you guys reach the Terrible Teens. I’ve got the framed ones here and there throughout the place. We had a great 27 hours going down and back to Tybee Island, Georgia. A ride that’s long but not too long. The weather was incredible. We didn’t do a whole hell of a lot. A few drinks and some so-so seafood at a beach bistro, accompanied by a duo performing old standards on acoustic guitars. That was a riot. Some of the patrons really got into it. We had breakfast at a classic old diner then did a couple of short walks on the beach, walked a little more once we rode back through Savannah (worth the visit) and then took a two lane road 40 miles into Hilton Head, where the traffic was just bonkers. It was miles and miles of stop-and-go for most cars. We really noticed the backup as we came out of HH Saturday afternoon on the return ride to Charlotte. We stopped to check out the timeshare (no news there; I have squandered the resource but am trying to figure out how to use it) and had a nice meal and cool drinks over at the Westin. That was fun. I could have nodded off at the table but it was time to hit the road again. We had a leisurely ride back to North Carolina. We are looking forward to the trip to St. Paul in mid July. Felicia has been through the airport but never really set foot on Minnesota ground. We’ll be there just long enough to not seem overbearing. Picked the first honest-to-goodness tomatoes we’ve ever had. The secret must’ve been the patio variety because the Big and Better Boys really just never got going in the big pots. There’s a bumper crop on the vine right now, believe you me. They don’t get real big, not quite the size of a tennis ball, but that’s a far cry from the ping pong ball size the last few years. Toss some of these tomatoes with a little basil and garlic, and you’ve got some nice pesto. Glad to hear you had your first ripe raspberry. Next year you should have oodles of the red rubies. You might go online to see if you need to cut those canes back. I’m guessing so but don’t quote me. Well, over and out from North Carolina. It’s getting warmer here, and warmth gives way sooner than later to boiler room heat. We may have to start dunking ourselves into the pool. The water level may rise, given my gain in weight. Hope nobody harpoons me.